The Butler County Historical Society will present on Saturday, July 8, the second of its summer multi-generational programs designed for children and their parents or grandparents. “All in a Day’s Work – In the Home” will focus on the common chores that would have been part of daily life while living on a Butler County farm during the 1800s. During this session we will be making butter and doing laundry and probably getting wet. We’ll shell and grind corn, make cornbread and taste what we make. We will also explore how pioneers used sorghum to sweeten food, ground for flour, popped like popcorn and made into brooms to clean up the home. All activities are designed as hands-on experiences with no set program. People can join the event anytime between 9:30 a.m. and 2 p.m. In the case of poor weather, activities will be moved inside to the Emma Ritchie Auditorium. The program will be held in the front yard of the society’s Benninghofen House museum at 327 North Second Street, Hamilton, and begin at 9:30 a.m. and end around 2 p.m. The program is free and open to the public, thanks to a generous grant from the W. E. Smith Family Trust of Oxford. Participants can also see the historical society’s year-long exhibit which focuses on the story of World War I in Butler County. “Over There, Over Here: Butler County Stories of World War I” opened last April and can be visited during the day. 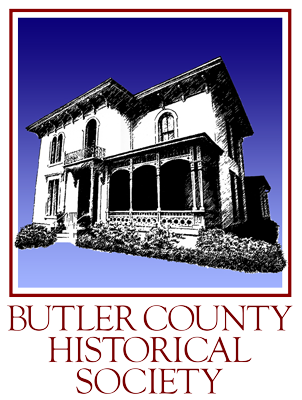 The Butler County Historical Society, located at 327 N. 2nd Street, Hamilton, is open to the public from 10 a.m. to 3 p.m. Tuesdays, Thursdays and Fridays and from 10 a.m. to 1 p.m. Saturdays. Group tours of the Benninghofen House Museum can be arranged by calling 896-9930. Tours may also be offered by appointment when available.